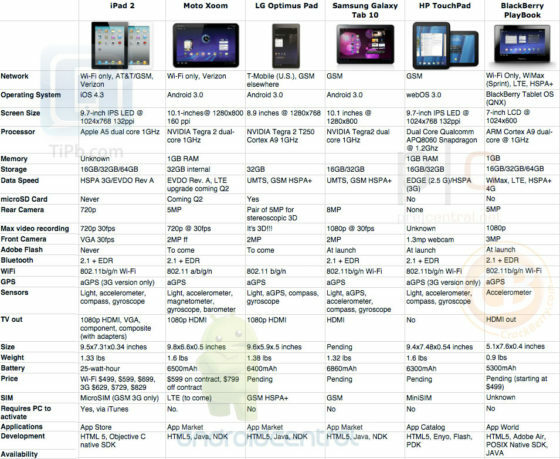 With the release of the iPad 2 just hours ago, a comparison amongst the latest and greatest tablets was only begging to take place. Some of the android tablets are not available yet like the Optimus and Galaxy. From the comparison one thing is clear, it’s a fantastic time to be a consumer. Never before were there so many choices in tablets. All of these are truly great devices in their own rights. Apple has gone off to an incredibly strong start with over 65000 apps dedicated to iPad alone with over a million more in the app store. Google and others will have to be very strong in their approach if they want to come close to the iPad 2.